Western blot analysis of extracts from various cell lines using E-Cadherin (32A8) Mouse mAb. 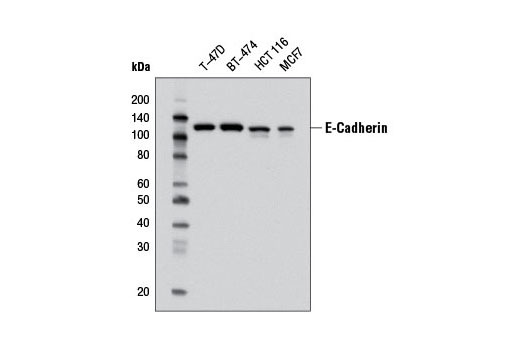 E-Cadherin (32A8) Mouse mAb detects endogenous levels of total E-cadherin protein. Monoclonal antibody is produced by immunizing animals with human cancer cell lines. E-Cadherin (32A8) Mouse mAb recognizes an epitope in the extracellular region of E-cadherin.